Subject: Tradition. “Dress your best to test your best”. “Interviewer: Can you talk about going out to buy that dress my sophomore year of high school… the first time we ever did dress your best to test your best? Interviewee: So, when I was growing up my mom would always take- when I was taking tests even through college… and buy me something to make me feel… uh… special. And to put me in the best state of mind for my tests. And then when Emerson was taking her first AP test we went out and got a dress and it’s her- was called her AP dress, from that day on… but like I- you- you started not wanting to- a dress, but like we would buy a shirt or some shorts or something. It was always like just dress up, get yourself in the best state of mind to take your test”. Background Info: C. Taylor grew up in Southern California. She had a close relationship with her mother and paternal grandmother who first introduced her to this custom. She passed it down to her daughter when the tests being taken became significant. She currently lives in San Clemente, CA with her husband and one daughter. Context: This tradition was shared over dinner with her daughter and husband when talking about various traditions passed down through the women in our lives. Analysis: While this custom appears indulgent, the principles behind it are simple and could be easily enacted without much pomp and circumstance. This tradition centers around the individual while simultaneously asserting a sense of belonging and responsibility within the family structure. First, the specific action being performed, shopping and then wearing new clothes to the test, is designed to make the person taking the test feel good about themselves. By putting on the clothes, there is an attempt to feel in control of the situation, even though they may not be. This evokes a type of sympathetic magic in which the practitioner makes themselves physically appear and feel their best to then trigger the best possible results from the test. Hence, it is all about the success of the individual and an attempt to control an indeterminant outcome. Furthermore, the practitioner is physically changing their appearance to commemorate the event, an outward statement that the test is important and deserving of the highest levels of dedication. Secondly, the build up to dressing your best to test your best presents an opportunity for mother and daughter to go out and perform a self-serving activity that is out of the normal. By performing a distinct activity and making the day a special occasion, an additional level of bonding is introduced. The positive feelings of the bonding trip are then commemorated by the apparel that is donned to make the tester feel confident and supported going into their test. It also simultaneously produces a sense of duty of child to parent, the parent has made an investment in the success of their child and so the child must perform well. In this way, this ritual is not unlike wearing a pair of lucky socks before a basketball game. A physical item is applied to the body to produce a desired outcome; only in this case, it is the newness of the item that gives it its special powers. San Clemente Rock Close- Up of frontside. Background Info: San Clemente, CA is the southernmost city of Orange County and consists of such beaches as Trestles, North Beach, T-Street, and Old Man’s Beach. The town motto is the Spanish Village by the Sea. Most of the city’s life revolves around the beach as the town’s main street, Del Mar, runs from El Camino Real to the pier. I have lived in San Clemente up until I moved to Los Angeles for college and return during the summer and winter holidays. 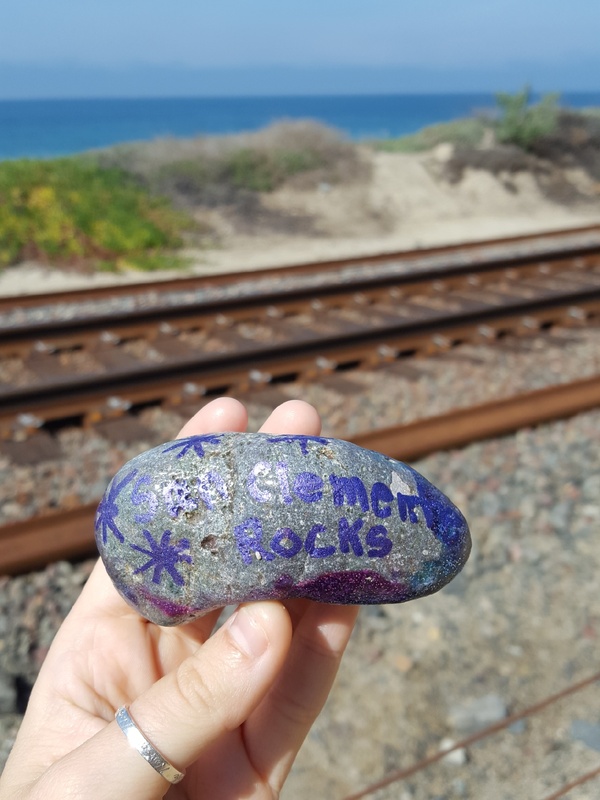 In January of 2017 an official city-wide club was formed to paint rocks to commemorate the life of Saylor Vorris, a junior at San Clemente High School when she passed away from leukemia. This movement was largely isolated to the Vorris family’s immediate acquaintances and the student body at San Clemente High. Members of the larger San Clemente population began to take notice of the rocks appearing at significant location in the north end of town. 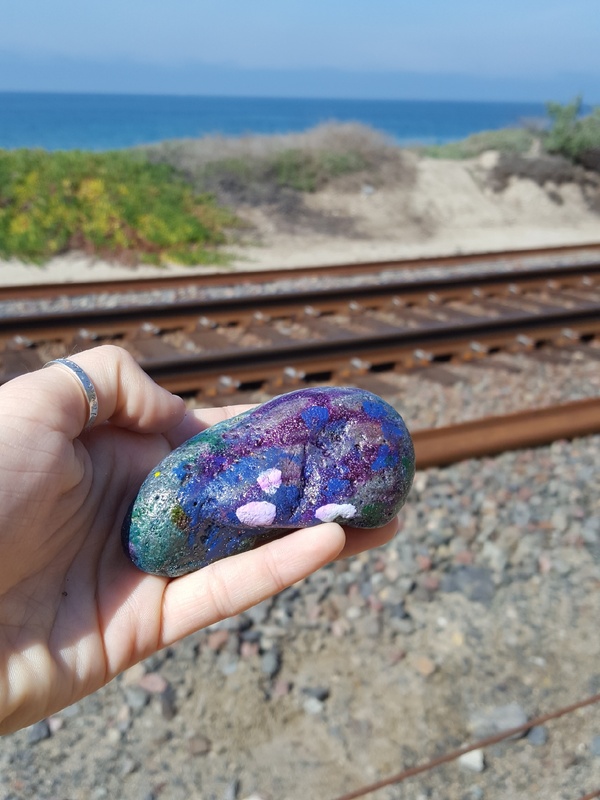 Then, in early 2018, painted rocks began appearing on beaches and walk paths in the North end of San Clemente in incomprehensible numbers. People who were not part of the original club nor aware of the significance began painting rocks and hiding them around town. The premise is then simple: if you find a rock, you can take it or simply move it to a new location. 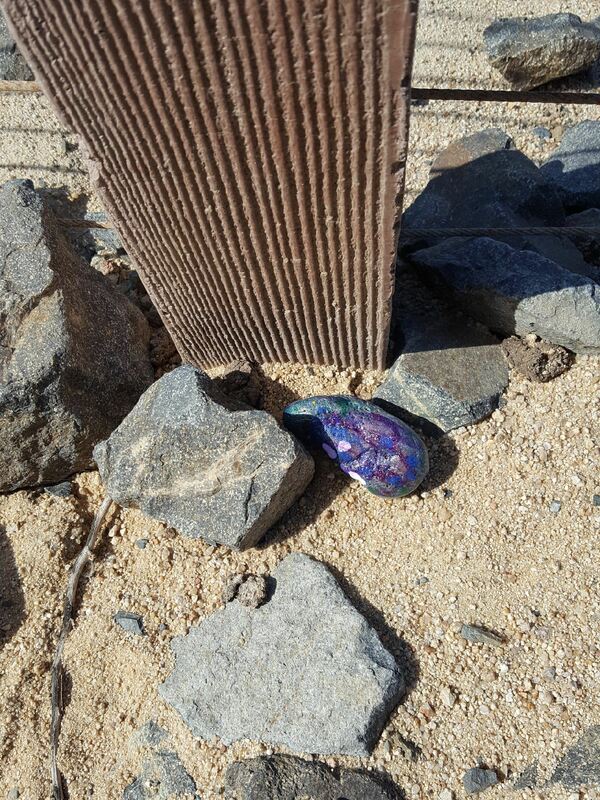 For many participants, if you take a rock it is then your responsibility to paint a new rock a place it around town. 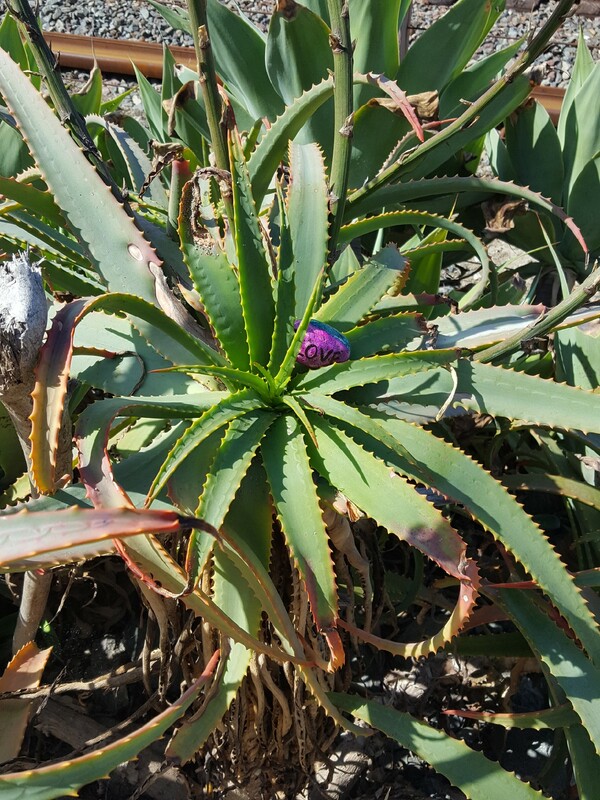 Context: I encountered the San Clemente Rocks when walking on the beach trail in San Clemente on 30 March 2018. My dad explained that the rocks were first placed by members of the San Clemente ROCKS organization but now more and more people from town are painting rocks and putting them around town to spread joy. I photographed and then moved the rock with “Love” written across it. I, however, kept the rock with “San Clemente Rocks” written on it as a reminder of home when I went back to school. Analysis: The rocks movement being adopted by more and more members of the community shows the active formation and reinforcing of identity. First, every time an individual makes a rock or moves one of the stones as part of the game, they are demonstrating through their behavior that they belong to the city of San Clemente. More than that, they are proud to be from San Clemente and want to publicly contribute to a culture of love, acceptance, and joy. The rocks work to actively define how citizens want to depict San Clemente to outsiders and allow them to fulfill that vision for themselves. With each rock that is painted, the idea of San Clemente as a community that cares about its residents is better realized and this identity is then embodied. 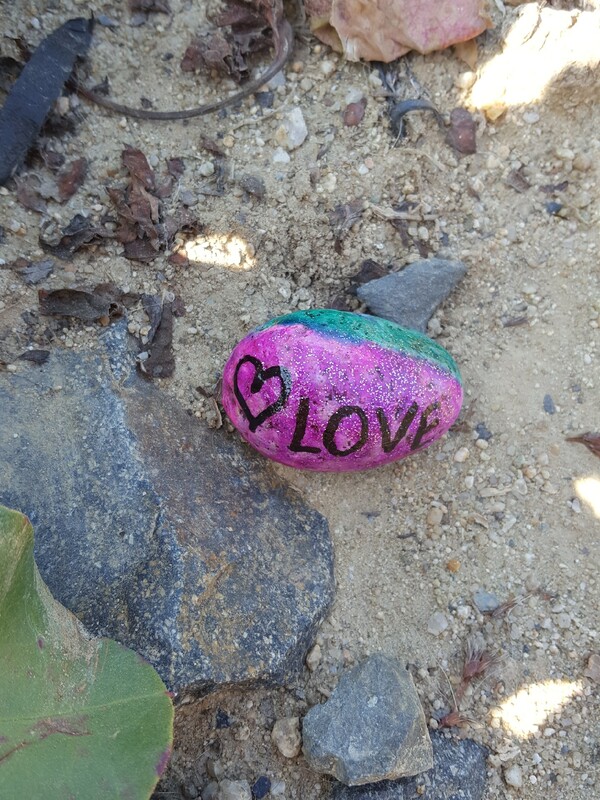 Second, to the San Clemente resident who is not participating in the rocks movement, they are the recipients of the joy that the painters are attempting to foster. The rocks serve as a reminder of what it means to call San Clemente home. As rocks are anonymous, it fosters an understanding that all residents are tied to one another on virtue of being from the specific place and participating in the culture of a small, beach town. Lastly, I ask myself: “why rocks”. I believe the answer more complicated than rocks are easy to paint and do not prove an obstruction to the natural environment. Most people who live in San Clemente are anti-development and anti-graffiti but pro-environment. Painting rocks is a seemingly benign way of making a mark on the community in an artistic way, with minimal destruction. Furthermore, San Clemente has seen a significant natural depletion of its beaches sand in the last decade, being replaced primarily by small rocks. By painting rocks, town members are taking control of our land and tying us to the natural environment. Painters and spectators alike are asserting a belonging to the land that transcends merely living and going to work in within town lines, we are thrusting ourselves into the composition of the environment. After college, my mom lived in Japan 7 years. She taught English to get by and apprenticed as a potter to gain experience. My dad visited her a few times, and picked up a lot of the culture alongside her. Though his knowledge is not as deep as hers, he still knows quite a bit. This is such a cool way to live. To apply symbolism, usually saved only for literature and movies here in America, to your everyday life is a whole other way of being. After the interview, my mom corrected a few pronunciation mistakes my dad had made, but all in all said his cultural memory was pretty accurate. A few times as a kid, we ate noodles first thing in the morning as a way of referencing my parents’ time in Japan. It was delicious and fun, and I will try to keep the tradition going with my children. 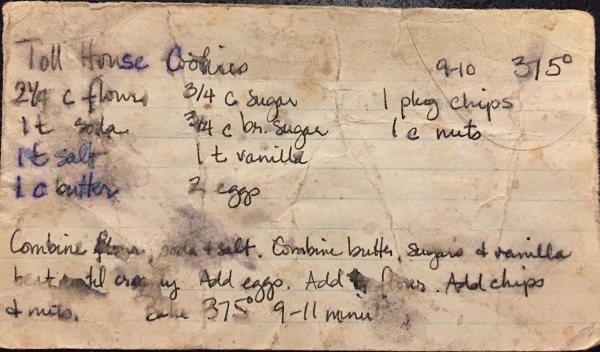 I’ll rewrite the recipe because the original recipe sheet is so tattered from use and time. Combine flour, (baking) soda + salt. Combine butter, sugar + vanilla (beat until creamy). Add eggs. Add flour. Add chips + nuts. Bake 375° 9-11 minutes. The recipe above is for the Informant’s homemade chocolate chip cookie recipe. I asked it there were any special instructions left out of the recipe card and she stressed the importance of various ingredients and methods. Real butter should always be used, never margarine. The butter should be at room temperature to make the mixing process easier. It has to be light brown sugar, not dark brown sugar to get the flavors right. She says the most important mistake people would often make is to not pack the sugar down into the measuring cup. It is a dense ¾ cup. Why they know it: She is Russian/Ukrainian and has eaten this dish many times. Why its eaten: This is a traditional dish and is often thought to give good luck to the person (and people at the party) if someone gets drunk enough and passes out in the salad. How they know it and what it means: Valery has eaten the dish every New Year’s Eve and has seen her grandmother make it many times. Not only is it a traditional Russian/Ukrainian dish but this dish has also become part of her family’s traditions. Thoughts: Through my investigations I have found that there is always a traditional dish, perhaps not a salad, but un every culture and every family. While I cannot relate to this specific dish, nor do I know what it tasks like, I can relate to the experience, the feelings you get when you make the dish and eat it with the ones you care about. This tradition definitely seems like fun, what’s better than good luck for everyone? Why they know it: My mother’s Great Aunt Mary would make this dish on special occasions and remembers watching her make it. The recipe is quite simple and there are no measurements, so the recipe is not typically written down, it’s shared in person. When is it made: This dish takes a long time to make and is thus made on special occasions. It is not made in a specific season or for a specific event, it just is not made for a weekly dinner. My mother says it typically made around the holidays. Why its done: Special events require special dishes. It is made because everyone tends to enjoy it and they are easy to share, its just the process that takes a while…and a good sense of smell. How they know it and what it means: Mary was raised in a family were this was a traditional dish and was made on the special events. Thus, it was passed down from her mother and so on and so forth. Thoughts: I have personally never tried this dish and don’t think I would like it as I am not very fond of cabbage but my mother tells me it is delicious and beautiful. I am not very adventurous when it comes the food I eat, and I tend to stay away from red meat; however, with my prior knowledge of Russian dishes and dishes in my family I can imagine that this dish would smell amazing. Why they know it: As a child, Navina was super curious, and would ask her parents about their traditions. When is it said: There isn’t a specific time in which this is said. It comes up more when asked about it. Thoughts: To me, this is one of the most unusual folklore I have collected. I was raised in a semi-vegetarian household; however, designating a specific day to be vegetarian is a new thought for me. None-the-less, I can respect that this is a weekly tradition for her family because I have a tradition similar in mine. These traditions help shape the person into who they are and what they do in life and in the world. It provides them with values they can hold onto.